Edna Lewis: Southerner or New Yorker? I never heard about Café Nicholson until I left New York. I had never heard of Edna Lewis, either. Several years ago, I started researching the changing discourses surrounding Southern food as part of my dissertation. As I kept inching the cut-off date for cookbooks I was reading forward—from the last ten years to the last five years, Miss Lewis hung around like a ghost. Though her own cookbooks were published years ago, I felt her presence everywhere in my contemporary conversations about the future of Southern food. She would appear in prefaces to southern cookbooks, in conversations with chefs, in magazine retrospectives. These hauntings painted a portrait of the “grande doyenne” of Southern cooking, of a soft-spoken, elegant presence, of a somehow “African” grandeur : the final bit never sitting quite well with me (see Karl Bissinger’s comment in Sweet Potato Pie that Lewis “looked like an African queen”). From these scattered remembrances, I took it upon myself to learn more about Lewis. I read her cookbooks and was (as I am sure you were, if you have read her cookbooks) whisked away by her scenes of rural Southern life, of vital community in the face of long days of agricultural labor. In her first widely-read cookbook, The Taste of Country Cooking, she speaks directly and clearly about the pains and pleasures of life in the sharecropping community in which she grew up: Freetown, Virginia. Lewis is so associated with the seasons, foods, and celebrations of African-American life in Freetown that I was surprised to learn that Lewis spent most of her life and career in New York. Her first job cooking was at Café Nicholson, a restaurant on the Upper East Side. Flamboyant restaurateur Johnny Nicholson filled a rented apartment with European antiques and bric-a-brac and opened a restaurant in 1949. Other fine dining establishments in the late 40s and early 50s had restrained dark wood paneling or intimate banquettes. Adding to its charm, Café Nicholson had a resident parrot. At Café Nicholson, Lewis served roast chicken and steaks with Béarnaise sauce. And every meal—all prix-fixe, and all set-menu—concluded with a chocolate soufflé. The simple American food delighted the Upper East Side intelligentsia, some of whom yearned for a more distinctly Southern approach Lewis once commented that “[Truman Capote] would come into my kitchen looking for biscuits.” Lewis left the restaurant after a few years, and in a New York Times write-up in 1982, Nicholson gets the credit for the recipes. 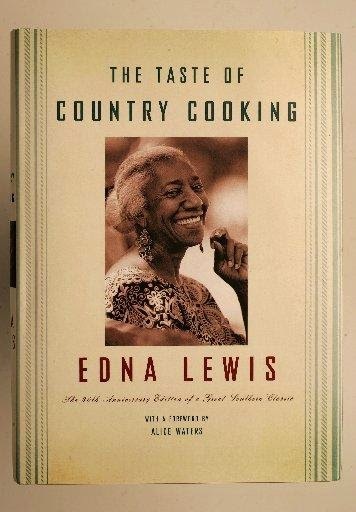 I’ve long been curious about the relationship between Lewis’ career in New York and her mythic presence still felt as the queen of Southern cooking. It’s as if Lewis has been cropped out of this story—the Gore Vidal, Henry Miller, Tennessee Williams story of New York’s Café Nicholson—in order to tell the story of the southern foods and farms she so vividly and tenderly describes in her cookbooks. Why? Is it because the presence of the black Lewis in the kitchen tells an uncomfortable truth about culinary labor (it’s underpaid and often performed by women and/or people of color)? Is it because Lewis’ career in New York troubles the stable and familiar cliché that to be from the South marks one as eternally ‘Southern?’ Is it that Lewis herself felt a certain degree of ambivalence about her career on the Upper East Side and preferred to be remembered by celebrating Freetown? I don’t know, but I can’t help digging to find out. Lewis sings the praises of Baker’s unsweetened chocolate, which simply doesn’t exist on this side of the pond (not that I am complaining about the quality of local chocolate!). 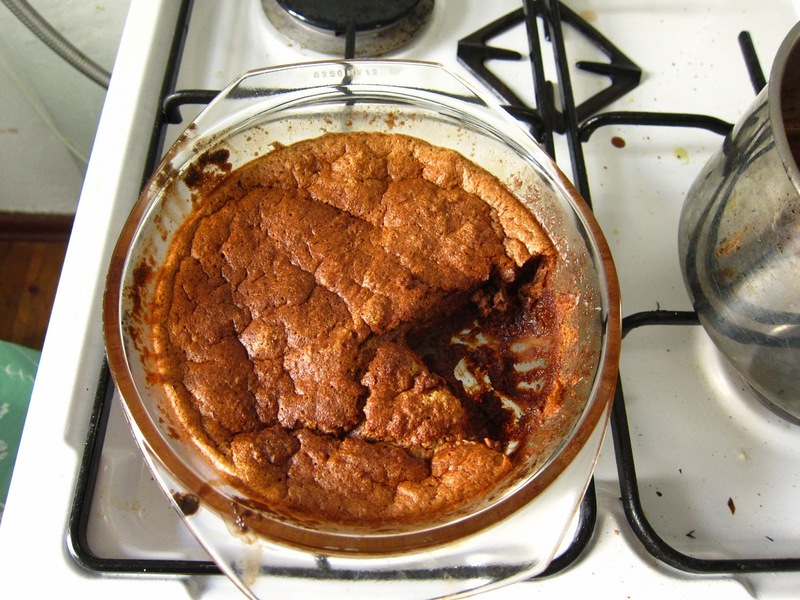 Suffice it to say that I don’t think my imperfect soufflé was worthy of Tennessee Williams or Gore Vidal. But it was very, very good indeed. Here’s Lewis’ recipe from her cookbook, The Pursuit of Flavor. She notes that at the restaurant, she used to let them finish cooking outside the oven, as they traveled across the labyrinthine dining room to the guests. She suggests that you allow your souffles to finish cooking outside the oven for a few moments, as well. To make the chocolate sauce: It will hold while you are making the souffle—which does not hold. Pour the chocolate, sugar, and water in a saucepan. Cook over low heat, stirring often, for about 20 minutes. The sauce should barely simmer. Just before serving, stir in the vanilla and serve hot. Preheat the oven 425 F.
To make the soufflé: Slowly heat the milk with the vanilla bean (if you are using vanilla, add it later) in a heavy saucepan. Remove the vanilla beans. Add the grated chocolate and butter, and stir rapidly with a whisk over medium heat. When the sauce has thickened and is smooth, remove the saucepan from the heat. Add the hot water, stirring. If using vanilla, add it now. Beat the egg yolks with the salt and sugar until light. Stir this into the sauce and continue to stir constantly for about 4 minutes. When ready, the mixture should look smooth and satiny. Let it cool briefly. Rinse each soufflé dish with water and quickly dry so they stay warm. Butter each one with about ¼ teaspoon of butter, and leave them on the stove to keep warm. Beat the egg whites until stiff but not dry. Pot the chocolate mixture over the whites and fold the two together. Spoon the soufflé batter into the buttered, warm soufflé dishes, filling each about three-fourths full. Put the souffles in the oven and reduce the heat to 400F. Bake the souffles for 12 or 13 minutes. (If making the souffle in a 2-qt. soufflé dish, bake it for 15 to 20 minutes.) Remove the souffles from the oven and dust the tops with confectioner’s sugar. To make the whipped cream: whip the cream until nearly stiff. Add the sugar and vanilla and keep beating until the cream is stiff. Serve the chocolate sauce and whipped cream on the side. Note: when serving a soufflé, place the sauces and whipped cream on the table before removing the soufflé from the oven. Fried Chicken and Sweet Potato Pie, DVD. 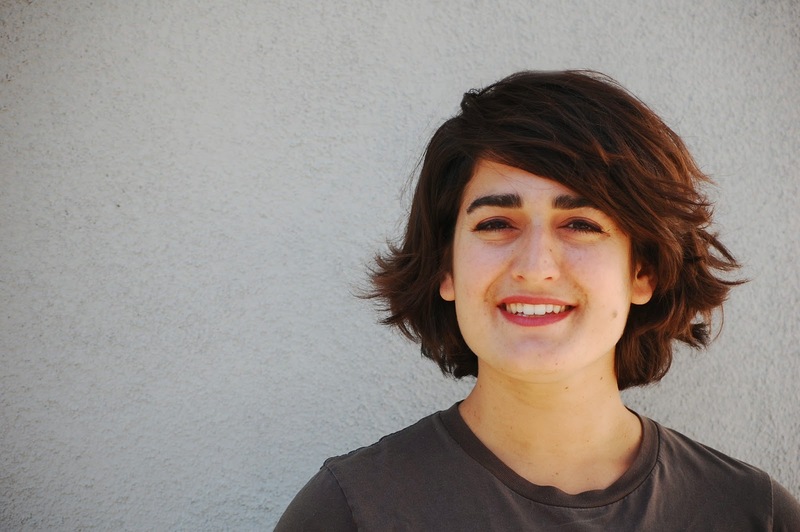 Directed by Bailey Barash. Atlanta, GA: Barash Productions, 2008. Edge, John T. “The Debts of Pleasure.” Oxford American 82 (September 2013). Lewis, Edna. The Taste of Country Cooking. New York: Alfred A. Knopf, 1976. Lewis, Edna and Mary Goodbody. In Pursuit of Flavor. New York: Alfred A. Knopf, 1988.